This statistic shows a forecast of the life expectancy at birth in the Netherlands from 2015 to 2060, by gender. 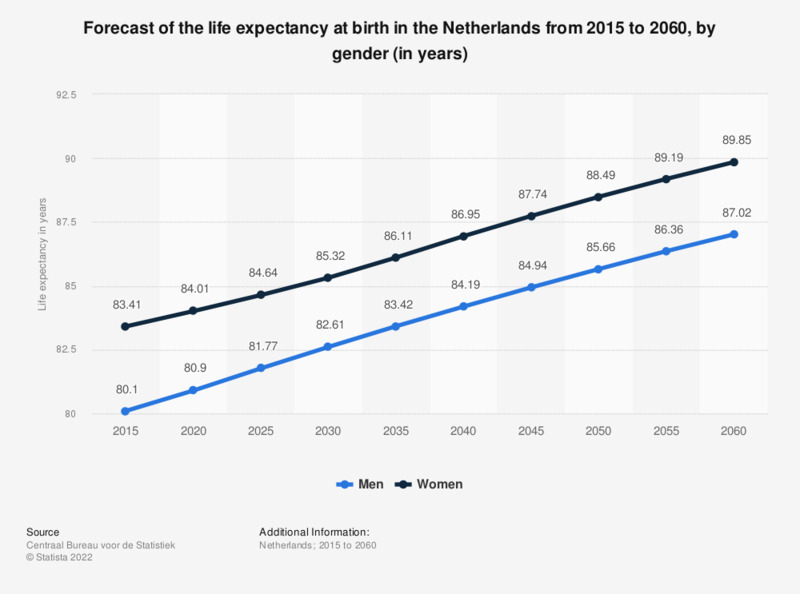 It reveals that the life expectancy at birth in the Netherlands will likely continue to increase in the period between 2015 and 2060, from 80 to 87 for men and from 83 to 90 for women. The average number of years a person would live, if he or she experienced the age-specific mortality rates for that time period throughout his or her life. Everything On "Demographics of the Netherlands" in One Document: Edited and Divided into Handy Chapters. Including Detailed References.